Teal Pumpkin Project- looks like a pumpkin from Tiffany's. What's not to love? Have you started to notice teal pumpkins creeping up onto doorsteps near you? They are likely part of the Teal Pumpkin Project. This is a great way to give all kids- especially those with food allergies a fun Halloween. A teal pumpkin at your house signifies that you have non-food treats. Things like markers, stickers, pencils, spider rings, etc can replace the sugary treats that are commonly offered. Please read more and download a poster with more information by clicking HERE. If you missed yesterday's post, you can watch my segment about the Teal Pumpkin Project on WFSB's Better Connecticut HERE. This is the craft paint I used. 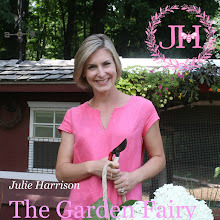 Please visit me at www.juliesharrison.com, and subscribe to my YouTube page JulieTheGardenGirl. Thanks for reading!